Just a few years ago, the welcome sign leading into the village of Deltaville was changed from “The Boatbuilding Capital of Chesapeake Bay” to “The Boating Capital of Chesapeake Bay”—an indication that the wooden boatbuilding industry that had long defined that community had waned. At the end of the 19th century and throughout much of the 20th, Deltaville boatbuilders turned out as many wooden deadrise boats as anywhere on the Chesapeake. Now, Willard Norris is the last active ol’ time wooden boatbuilder in town. He is 90 years old, has bad knees, and 30 years ago was deemed terminally ill with pancreatic cancer. He beat cancer, and fends off the pain in his knees to go to his backyard shed to build wooden boats. In 1927, Norris was born to a boatbuilding family in his grandfather’s home at the end of Lovers Lane in Deltaville. He can’t recall the first time he wheeled a foot adze to shape a boat, but he knows he was mighty young. He had boatwrights on both sides of his family. His grandfather Ed Deagle built deadrise style boats on the shoreline in front of the house where he was born. His uncle Pete Deagle specialized in repairing Chesapeake Bay log canoes next door to his grandfather’s home. Another uncle, Alfred Norris, built deadrise boats a little ways down the lane, and Willard’s cousin Hugh Norris was building a bit farther down the way. As a boy, Willard learned the art of setting up a deadrise boat—the method of establishing the shape of the boat at the start of the project—from his uncle Alfred, whom he’d help after grade school classes let out. Alfred had a boat shed behind his house and built a couple of 38-foot round stern deadrise boats a year. His uncle on his mother’s side was Lee Deagle, who owned and operated Deagle and Son Marine Railway on Fishing Bay. In the summer of Willard’s junior year, he went to work for his Uncle Lee. Willard and his wife Shirley got married when they were 18 years old. One of the first things he did to support the marriage was build a round-stern deadrise workboat for patent-tonging oysters in the winter to supplement his boatyard income over the slow months. “Mr. Wright looked at it and said ‘let me tell you something, you do it the way you think it is right and if you need to change it, you can do it on the next boat, but if you let everybody tell you how to build a boat, it’s going to end up being a damn mess!’ I took that to mean that my round stern looked all right,” says Willard. After about a year of marriage, Willard and Shirley decided to build a home on Lovers Lane, where they live today. “We went to the bank and they let us borrow $1,000, but no more,” says Willard. “When we ran out of money and needed more for wallboard and lumber, a waterman came by who needed an 18-foot flat-bottom skiff built. I gave him a price and he agreed. Shirley helped me, and we built that flat-bottom skiff on the dirt floor where our living room is now. We took the money we made off the boat and put it towards materials for our house,” he says. Sometime in the 1960s, Willard was approached by Virginia Marine Resources Commission about a full-time boat repair and maintenance position. While working days for VMRC, Willard built boats at night in his yard to make extra money. He eventually built a boat shed behind his home and turned out over 100 boats over the years ranging from 16-foot, flat-bottom skiffs to 45-foot deadrise boats. Willard’s boat shed is the last active backyard boatbuilding shed in Deltaville. Inside his shop, he has old hand woodworking tools that he has picked up at yard sales, and other tools given to him by retiring boatbuilders. “When I built my boat shed, I built her high enough that I could turn a large deadrise hull over inside the shed,” he says. “I bought a block and tackle that had come off a three-mast schooner. It’s mounted in my boat shed ceiling right now. I still use it to turn my boats over.” Deltaville boatbuilders have traditionally built their hulls upside down and flipped the boats over to install the washboards, decking and pilothouses. When boatbuilding was flourishing, several builders got together and had a community launch trailer built to haul finished boats down to the creek. It had a V cut into a wooden brace across the front axle to slip the deadrise bow down into it. “When I needed the trailer I’d go to the last builder who used it and bring it to my place, haul my boat and then store it behind my shed until somebody else needed it. When they stopped coming to get the trailer I knew I was the last builder.” That was 20 years ago. Willard recently gave the trailer to the Deltaville Maritime Museum. Lovers Lane boats were launched at Lewis Wright’s boat shop ramp at the end of the road on Jackson Creek. Launchings were occasions for a gathering of Deltaville boatbuilders who would come to help. Willard launched his big 38- to 45-foot boats without engines. He built the engine beds and had local mechanics Willis Wilson or Virgil Miller drop the engines after the boat was launched. 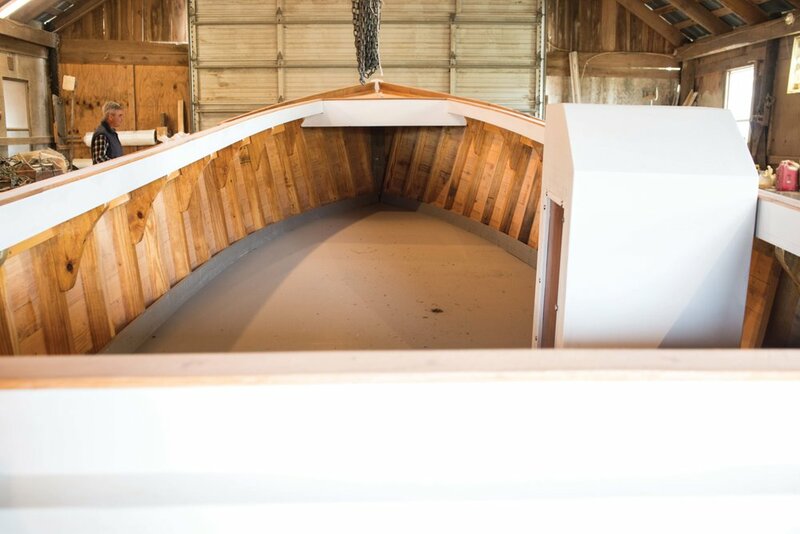 Currently, Willard has two boats in his shop—a completed 25.5-foot deadrise and a 20-foot flat-bottom skiff awaiting fiberglassing. Both are outboard-powered and made from juniper and spruce pine. Using West Epoxy system, Willard fiberglasses the floor, decks, bottom and halfway up the exterior sides. Willard has ordered materials for another skiff, the start of yet another wooden boat to be built in Deltaville. He hopes to be building boats when he turns 100. 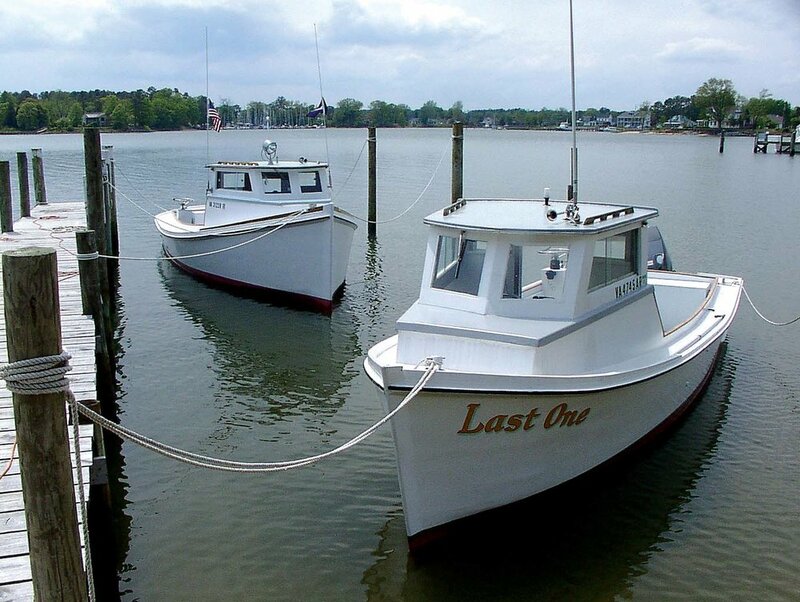 A longtime Chesapeake Bay writer from Urbanna, Virginia, Larry Chowning has authored nine books including Deadrise and Cross-planked and Chesapeake Buyboats— definitive histories of iconic Chesapeake Bay vessels.